In a multi-media lecture combining photographs, film, songs, and quotations from writers and poets Libby Horner offers a kaleidoscopic view of the cars and characters involved in the Mille Miglia race. The Mille Miglia, or thousand miles, was an endurance race organised 24 times between 1927 and 1957. Participants raced their Gran Turismo cars over the open roads of northern Italy from Brescia to Rome and back on an 8-shaped route. 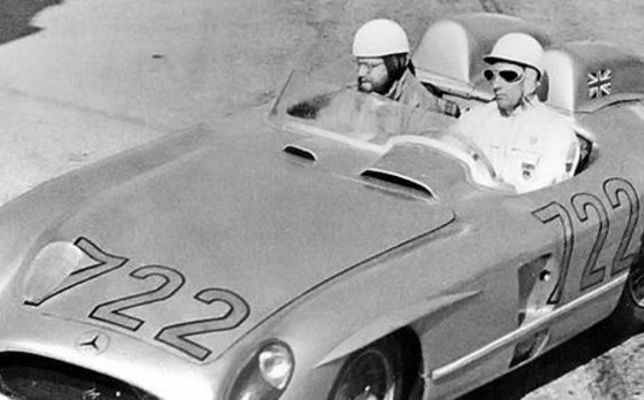 In 1955 Stirling Moss and Denis Jenkinson, driving a silver Mercedes 300 SLR, won the 1000 mile open-road race round Italy with a staggering average speed of 98.53 mph, which didn’t allow them any time for pit stops or exploration. In 2014 Libby Horner, our lecturer, and her navigator repeated this journey driving an iconic red Alfa Romeo in a much more leisurely fashion with numerous detours to sample local food, wine, music, architecture and art. In a multi-media lecture combining photographs, film, songs, and quotations from writers and poets she offers a kaleidoscopic view of the cars and characters involved in the race. Libby is a freelance art historian, curator, film producer, lecturer and writer. The lectures at Quay Arts Centre, Newport begin at 8pm (running until 9.15pm), but the cafe is open from 6.30pm if anyone wants to take advantage of a meal or drinks before the lecture. The cost to visitors is £8. Find out more about the VDFAS by visiting the Website.